The last crop from our garden was harvested, cleaned & cooked last week into a delicious late-harvest meal. Mum & Dad pulled out our crop of leeks, a hardy fall vegetable, and Mum made a lovely chicken dish in a flavorful leek-based sauce. 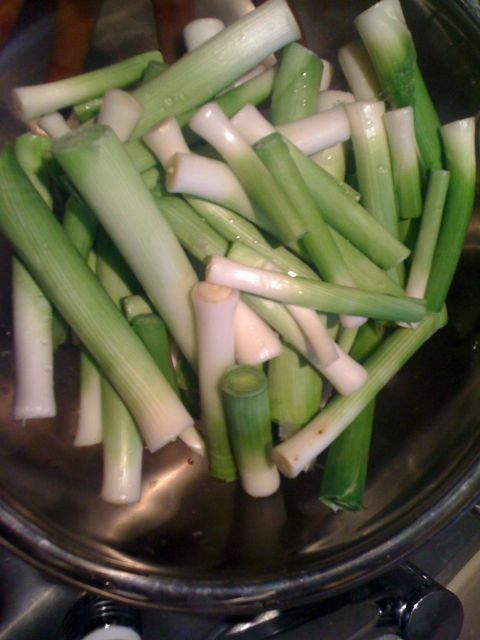 As you can see in the photo below our leeks featured a nice crisp white stem with tall, leafy green tops. No, sadly our leeks just didn’t grow that big. The leeks in the market right now are fat, practically bulging, practically waving their size & healthiness in our faces. Our leeks tasted fine, as leeky as you like, but were just small. Tiny. Mini-leeks. This is likely caused by a couple if different things: 1) our soil is thick with clay and I think this means the veg have a harder time pushing through the soil to come to their normal size. This has happened to us with other under-ground-growing types of veg (onions the most obvious example). 2) I think we were supposed to thin out the little leeklings when they were very wee. We didn’t do that, it seemed kind of inhumane to sacrifice every second plant. That and we might have forgotten. Oh, and did I mention we have no idea what we’re doing? Yeah, that might have something to do with it too. I think the question was rhetorical, but I took it as a compliment nonetheless. 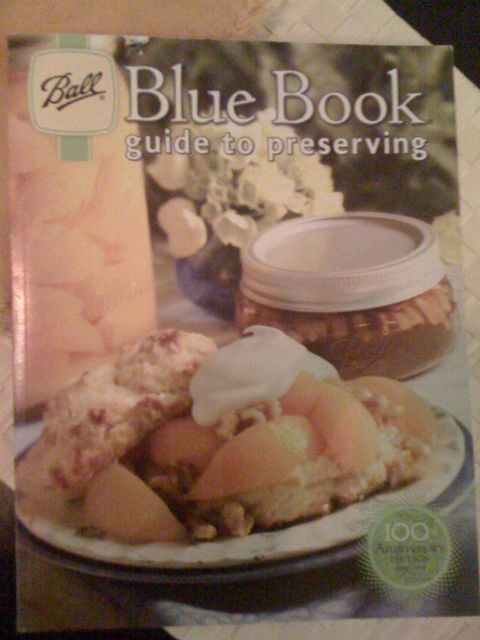 Why yes, we are as competent and meticulous as the fine chefs behind one of cooking’s best respected publications . The truth is that there is quite a lot of science-y type stuff at work when canning & preserving. There are chemical reactions, there’s the sterilizing of instruments, there is precise timing. 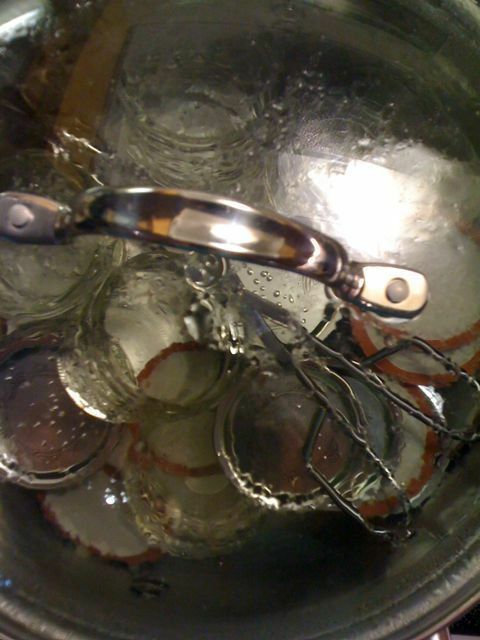 With multiple pots on the boil at any time, one sterilizing the jars, lids & tongs (as you can see in this picture) the other filled with a roiling concoction of sugar, vinegar and pureed good stuff from the garden, a person can tend to feel like a mad scientist. Either that or one of Macbeth’s witches. So what did the long Thanksgiving weekend bring? A trip to the only grocery store open on holiday Monday ( thank you Rideau St. Metro! ), more chopping of the (hopefully) final crop of jalapeños and 12 gorgeous little jars of our now-famous jalapeño jelly. Ooh! And here’s an idea: take some cream cheese and a few spoonfuls of the jelly, mush it together and eat it on crackers! Yum. (because on holiday Monday after our big Thanksgiving meal even more food was required). Seriously, you all are getting some of this so you’ll need the recipe ideas. Usually onions make a person cry when that person is chopping them in prep for a delicious meal like a flavorful pasta sauce or a hearty chili. Well when it comes to these onions I’m crying before I’ve even picked up a knife because they just won’t grow. Or I should say they just didn’t grow. 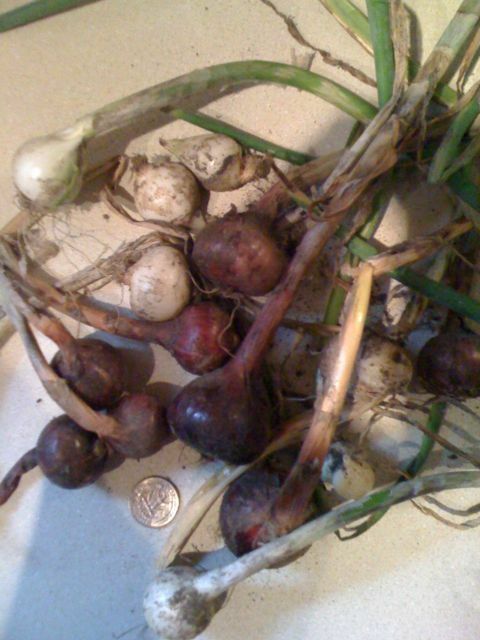 Or I should say they grew, but not past the size of shallots. Sigh. Let the tears begin. As you can see from the photo we planted a lovely array of white and red onions this year and their colour was great, their stalks were green and straight and their bulbs never grew past the size of a quarter. Yes, that is a quarter in the photo to show scale. I repeat, sigh. I don’t know what went wrong. 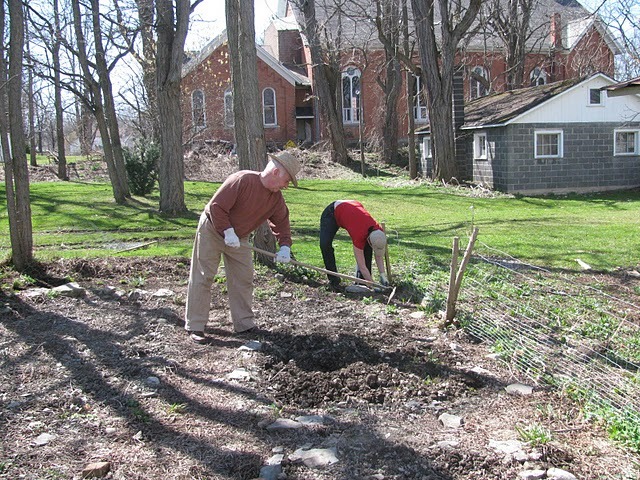 We chopped off the scapes when we were supposed to, we weeded, we watered, we loved them and spoke kindly to them. The puzzling other thing is that our other underground crops like garlic and potatoes did well, so it’s not like we can’t grow things underground. Last year our onions had a similar fate. Stunted. Relegated to faux-shallot status with none of the complex and alluring flavor of that delicious little gem, and all of the densely-packed bitterness you’d imagine of an onion never able to live up to it’s true potential. Any advice from onion experts out there? Last fall we planted garlic for the first time. We stopped in at the Agway in Ithaca for a non-garlic related errand and upon entering were greeted with bins of garlic cloves for planting. I thought to myself Ooh! Garlic! We should plant garlic! How cool would it be to plant garlic, then it’ll grow and then we’ll have garlic. That we planted ourselves! Actually, I probably said that out loud too. So we planted the little garlic cloves that you plant (which look remarkably similar to the ones you eat) in the fall of last year and then we waited. A long time. Which is tough for those of us with short attention spans. We finally dug it up about 2 weeks ago and were quit happy with the results. I mean, the looked like garlic. A bit small maybe, but definitely garlicky. And the began the process of curing them so they’ll last longer– this transforms them into the garlic with the dry, papery, white skins that you’re familiar with. I just lay them out on a laundry drying rack for 2 weeks on the screened-in porch and it worked well. Except for the more waiting part which didn’t go well with the aforementioned no attention span part. 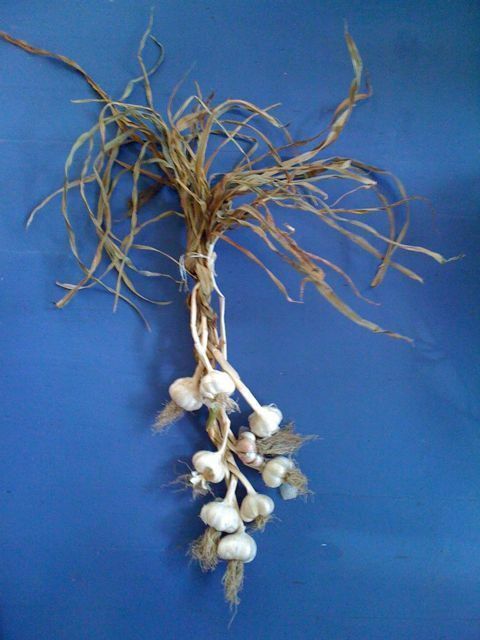 But… Yesterday I realized that the requisite 2 week curing period was up and it was time to make the requisite garlic braid which will look all folksy and sweet and be a great way to store the garlic throughout the year. I had read about how to braid garlic but I thought to myself I know how to braid hair… How different could this be? Um, so the answer to that is, um, pretty different. But I proceeded pretending that the dry garlic stems was hair that I was French braiding and the result was… Well, a bit lopsided and kooky looking, but serviceable for my first-ever garlic braid. For the record, hair is easier. money in taste, calories and sodium content. What could be simpler and more delicious that taking adorable new potatoes and boiling them in water with a crapload of salt in it? Nothing, I tell you, and it’s one of the surest signs of summer too. It’s apparently a product of local salt miners getting creative/resourceful around the lunch hour. For a great article with more factual accuracies than you’re likely to get on this blog check out the latest issue of Edible Finger Lakes. Many folks around here grew up eating this delicacy and in the last 2 weeks I’ve been here I can attest to their pervasiveness. I think I’ve had them at least 4 times, including an incredibly butter-drenched serving at the Lodi Library Fundraising chicken BBQ. My arteries are not pleased with me at all. And folks, here’s a wee tip: it IS possible to have too much of a good thing (trust me. “put in a ton of salt and then just when you think you’ve put in too much, keep going” were the words that led to inedibly salty potatoes. So tragic; so, so salty). 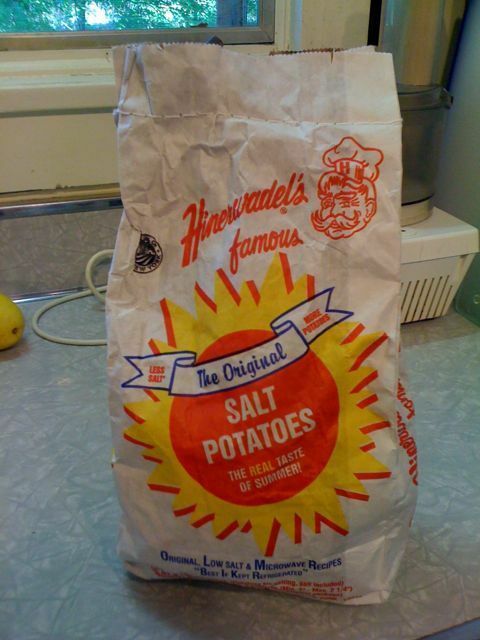 Here’s the ratio discovered by making careful notes from consuming the last bag of salt potatoes: 5 pounds potatoes, boiled in 4 quarts of water with 1 cup of salt for 20 minutes. Gardening is messy work requiring lots of tools and reference materials and things that can get lost, misplaced or stepped on! 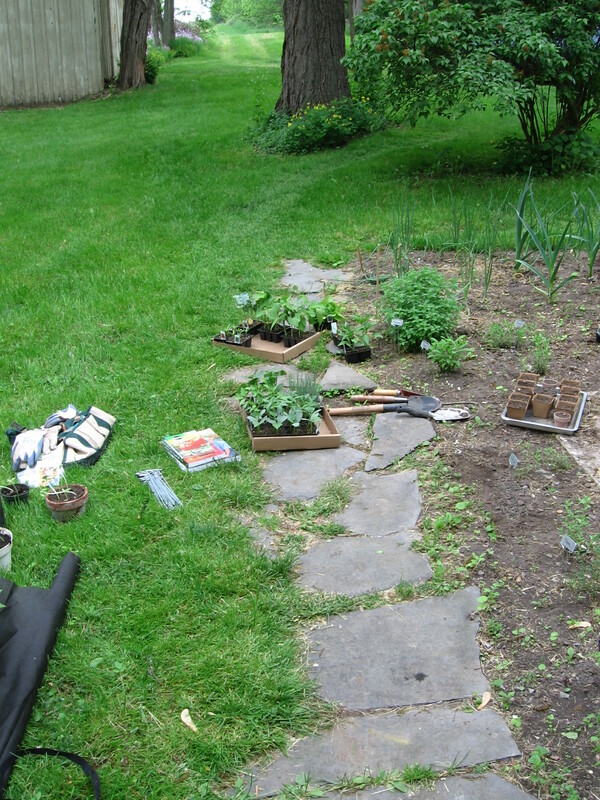 Here you can see the basic materials laid out in anticipation of being applied in gardeny kinds of ways. The Countryside Produce farm stand on Munson Road between Lodi and Interlaken really came through for us and you can see the flats of peppers among other things here. 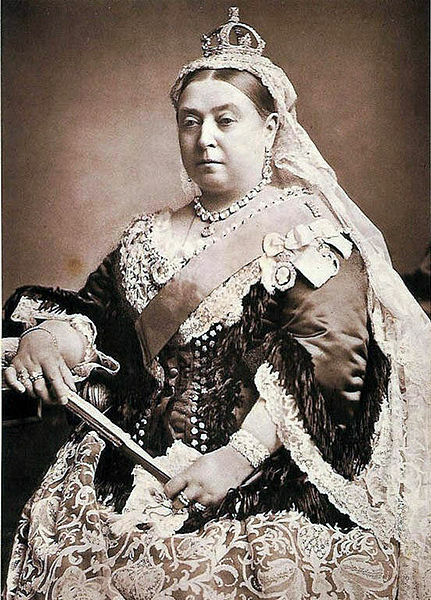 Well, it’s Victoria Day weekend here in Canada and that means many things. For those of us hoping to have fresh produce on our tables later in the summer it means that it’s time to put in the garden! In *theory* and by general rule of thumb, the “risk of last frost” is the Victoria Day weekend. So I’m about to make the trek down to Lodi (where they of course don’t celebrate Queen Victoria’s birthday. Will someone remind me why we still do that in Canada?) for our first really big gardening weekend of the season. We will have our work cut out for us. We’ll need to fence up the new garden plots if we want our produce to be anything other than a woodchuck buffet. We’ll need to head up to the Amish markets to buy our healthy little plants and then do the stoop labour of planting them in their tidy little rows. This year we have some handy-dandy plant stakes that I will painstakingly and lovingly craft and apply in the appropriate areas. I also have the feeling that there will be some prodigious weeding to do. Two weeks ago my family celebrated an early U.S. Thanksgiving during a long weekend in Lodi. We indulged in the usual Thanksgiving activities (eating too much and shopping too much) and we also made some significant progress on next year’s garden plans. Of course turkey and Thanksgiving are a perfect pairing but this year we were determined to go local with our Thanksgiving dinner. Our summer garden triumphs put local food at the forefront of our eating habits and Thanksgiving was no reason to stray from this philosophy. We grudgingly headed off to the Green Star Co-op in Ithaca– I say grudgingly because I was certain that we would be dropping a princely sum for this local turkey. Come to find out that Green Star was selling their supply of local turkeys at the wholesale price. We assumed that this was a good faith gesture intended to promote local farmers and the philosophy of eating locally produced food, especially meats. We were thrilled and acquired a 12-lb bird from a farm in nearby Interlaken, NY called Oink and Gobble Farms. The local turkey tasted… great! 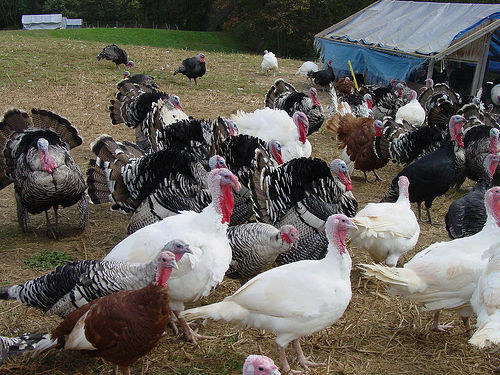 Was is significantly different than an industrial farming food chain turkey? I hate to admit that I couldn’t taste a huge difference. But it was moist, delicious, reasonably priced and grew up just about 15 minutes down the road from the dinner table at which we were enjoying it! The Garden News is very big, very exciting and hopefully very sunny. One of the (ahem, many) problems with the garden plots we chose last year for our first ever garden was the shadiness of the spot. It looked great in the late winter when the trees surrounding it had no leaves, but we quickly learned that it was awfully shady. So our new spots include a couple of different areas right at the end of the property where it abuts the farmed acreage. We figure that it must be good soil being that close to the farmland and it is in a much (hopefully!) sunnier area. Of course the trees have no leaves now either, but with our skillful plotting of the sun’s trajectory we think we’ve avoided the major shade issues. Oh, and the other news? More walnuts. Yup, being a glutton for punishment, I said yes when Dad offered to collect more walnuts on his clean-up of the roof and the grounds. We sat and removed the mostly rotten husks (an extraordinarily gross job) and then laid them out on a board in the basement in the manner we believe that Grandma would have done. We’ll see in the spring how this method compares to the oven-roasting method.